Using an exclusive content-first framework, create your portfolio the right way the first time, faster than ever. Thanks for signing up to receive The UX Case Study Template. If you're looking for a UX design job, you know that having a solid portfolio is essential. No portfolio, no job - simple as that. But there are countless pitfalls of the portfolio building process. You don’t know how to tailor your portfolio around your existing experiences & projects. Hi, I'm Oz Chen - the founder of UXBeginner.com and creator of the UX Portfolio Course. As a career transitioner, I struggled to create my first UX portfolio. I made ALL the pitfalls listed above, taking months to land my first UX job. At first, I had countless failures creating the design portfolio from scratch. What to write? How to structure the story? Most of how, what the heck are employers looking for anyway? After landing my first UX jobs and clients, and finally working 1-on-1 with UX bootcamp grads as a career coach, I've identified the factors that made the most difference during the portoflio building process. As a result, I've developed a fine-tuned process for creating UX portfolios in less time and with higher likelihood to land interviews. "Oz made this course very simple and to the point. The task of creating UX case studies and building my portfolio doesn't seem like such a daunting task. The resources are great and I can't thank Oz enough for putting this course together." The good news is that there's a new way create a design portfolio, that's optimized for landing the hot UX Designer and Product Designer roles that are so in demand right now. It's called The Content-First Strategy. 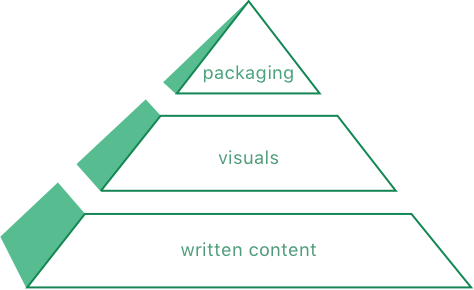 Instead of wasting hours going back and forth on design details that don't matter (we've all been there), use my battle-tested writing process and content templates that dramatically speeds up the creation - and quality - of your UX portfolio. FIRST, use the right mental framework to approach the process of building a UX portfolio. SECOND, use my provided templates to write your UX case study. I’ll walk you step by step how to write each case study’s beginning, middle and end. THIRD, learn to package your case studies individually, and into a future-proof “offline” portfolio optimal to use for UX interviews. I’ll also teach you neat tricks to easily turn your offline portfolio into an “online” portfolio that doesn’t require you to mess with any web hosting. Using this robust system, hundreds of my students have completed their UX portfolios and landed their first design jobs. In the upcoming 2.0 update to the original UX portfolio course, I’ll walk you through how to translate all of this into a online portfolio that stands out, plus never-before-seen modules that'll help you get the extra competitive edge for UX roles in 2019 and beyond. Arriving in November 2018, The UX Portfolio Course 2.0 delivers a three part punch: crafting case studies, building the web portfolio, advanced topics (and much more)! I’m rebuilding The Ultimate UX Portfolio Course from the ground up into The UX Portfolio Course 2.0. Early supporters get the classic course immediately, then the upgraded course when it's released in Nov 2018. Buy version 1 today for 50% off, and get the full upgrade as it's released - including updated portfolio templates and example case studies. This is a comprehensive course that requires dedication and time. It comes with templates to help write your content so you'll be able to build your portfolio alongside the course. By the end of the course, you'll have developed a solid portfolio that can be used to apply for UX Design jobs. If you feel like one of the thousands of designers who've been missing guidance on this precious portfolio building process, then this course was built with you in mind. ▸ What's the length & format of this course? This is a 100% self-paced online course with 2+ hours of video lectures. ▸ Who is this course for? Because this course is structured to help you build a UX portfolio from the ground up, it’s especially beneficial for new UX designers creating their portfolio for the first time. For anyone who wants to redo or update their portfolio with a systematic process, the knowledge outlined in this course is still highly relevant. ▸ What tools are required for this course? Designers looking for jobs in User Experience or Product Design. The portfolio is a non-negotiable piece of the hiring process, and prospective students can learn how to best present their portfolio to increase their odds of getting a UX job. Beginning designers who have at least 1 project to create a portfolio around. This is a highly hands on course that involves writing and packaging case studies and portfolios. Thus it's not ideal for absolute beginners who haven't completed at least 1 UX project. Designers looking to update their design portfolio with best practices tailored for the UX Job market. ▸ What can you achieve after taking this course? Advanced topics like choosing domain names, web hosts, and how to handle NDA work in your portfolio. ▸ What bonuses are available if I enroll now? 50% off the final launch price of the 2.0 version. A free UX portfolio review by Oz, worth $250. Since you already provided your email, I’ll send updates on the development of UX Portfolio Course 2.0. Until then, enjoy the free The UX Case Study Template. It’s in your inbox at the email you provided earlier. P.S. current UX School Bundle customers will receive The UX Portfolio Course 2.0 completely free of charge.